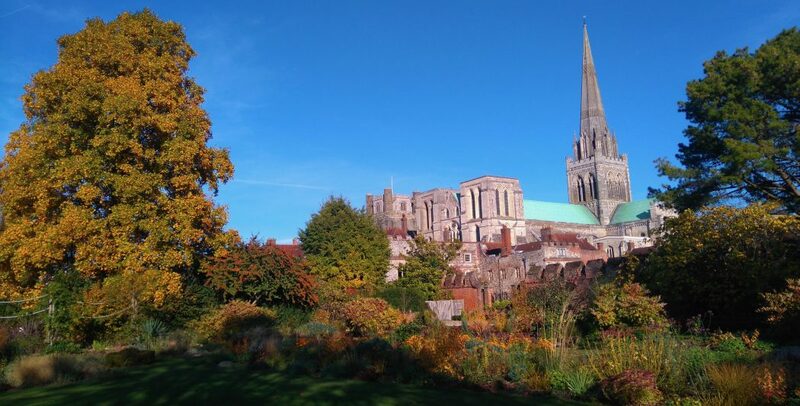 Editor’s Note: This article is the second in a series by Naomi Billingsley, who will be writing on reflections on art at Chichester Cathedral. In my previous piece about the art at Chichester, I discussed some of the oldest works in the Cathedral – the Romanesque reliefs depicting scenes from the raising of Lazarus. This article brings us forward, to the 20th century, and a work which celebrated its 50th anniversary this year: the tapestry by John Piper at the high altar. 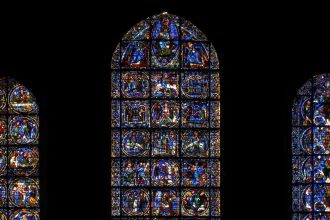 A photograph of the piece is available on the Cathedral’s website here. Known simply as ‘The Piper Tapestry’, this piece was commissioned by Walter Hussey, Dean of Chichester (1955-77). As parish priest at St Matthew’s in Northampton, and then as Dean of Chichester, Hussey was a great champion of the arts in the round – commissioning works of art and musical compositions, and inviting figures such as authors to give sermons. The Piper Tapestry was part of a reordering of the quire in the 1960s. Hussey decided that an injection of colour was needed at the high altar, and in 1963 approached Piper to produce a design to adorn the 16 th century Sherbourne screen. Hussey insisted that whenever something was added to a church in centuries past, it was executed in the contemporary style, and so it should be in the modern age. Piper explored a number of different mediums before deciding upon tapestry – a medium that would sit comfortably alongside the screen, but that he could make his own. In fact, the piece consists of seven tapestries, hanging in each of the bays of the screen, which are read as a continuous design. This was Piper’s first work in this medium. The subject of the tapestry also went through various iterations before the final conception, consisting of symbols of the Trinity (the dedication of the Cathedral) in the central portion, and on either side depictions of the four classical elements (earth, air, fire and water) and the beasts associated with the Evangelists (the man for Matthew, the lion for Mark, the ox for Luke and the Eagle for John). Piper had prepared a version of this scheme by the end of 1964, but at this point Lancelot Mason, Archdeacon of Chichester, raised an objection: in the central portion, Piper had included a Tau cross for the Son, a flame for the Holy Spirit, and a triangle for the Father. Mason objected that the triangle was a symbol of the Trinity and could not represent the Father; Piper would, Mason insisted, need to add another symbol. Piper was unhappy about this request at a late stage in the process, having felt that the design had reached its final form, but eventually he decided to add a white light, in addition to the triangle, giving the composition of elements that we see in the final design. The tapestries were woven by Pinton Frères in Felletin near Aubusson in central France, and installed in 1966. Their dedication took place at Evensong on 20 September. Hussey had certainly achieved his desired injection of colour into the space, but although he was delighted with the result, the public reception was rather mixed. Both Hussey and the local press received numerous letters about the tapestries – some delighting in this bold introduction to the Cathedral interior, but others claiming that it was too garish; some even wrote that they could not take Communion before it. Perhaps the most famous objector was Cheslyn Jones, Canon Chancellor at the Cathedral, who reportedly wore dark glasses to the dedication service. Fifty years later, in September this year, the anniversary was marked with a prayer from the dedication service being read at Evensong, which was followed by a talk in which I told the story of the tapestry and shared some contemporary responses to it. The current Chancellor, Anthony Cane, dug out his own dark glasses for the occasion in a nod to his predecessor. The occasion brought to life the richness of this piece and the regard in which it is held by the Cathedral community; at the end of the talk, I invited the audience to share their own thoughts on the tapestry. A popular interpretation of the ‘air’ motifs – the most difficult element to depict in visual form – was that there is something of Sputnik I (the first artificial satellite, launched in 1957) in Piper’s choice of forms. Although I have not come across Piper mentioning this inspiration, this interpretation certainly resonates with the era of early space exploration at the time when the tapestry was created. Another memorable impression shared was that the dramatic shard of red background in the central portion of the design can be seen as the opening of the veil in the Temple in Jerusalem, torn in two at the moment of Jesus’ death (Matthew 27:51; Mark 15:38; Luke 23:45). This biblical moment represents God’s presence bursting forth into the world, and the speaker who proposed this interpretation of the tapestry felt that the symbols in the central portion seem to burst from the surface of the hangings. Extending this reading to consider the other symbols included in the tapestry, we have a vision of God’s presence embracing all Creation – the world, beasts and humankind. After fifty years, Piper’s tapestry still feels daring and challenging, and doubtless does not please all. But, to paraphrase a participant in a discussion group I held about the tapestry, Christianity is not safe and wishy-washy, and in similar fashion, so the tapestry continues to do important service to the Cathedral. Naomi Billingsley, ‘“A Magnificent Adornment to this House of God”? The Piper Tapestry at 50’, Lecture at Chichester Cathedral (22 September 2016). Paul Foster (ed.). Chichester Tapestries. Lurçat – Piper – Benker: A Sequence of Exploration (Otter Memorial Paper 7) (Chichester: Bishop Otter College, 1991). Walter Hussey, Patron of Art: The Revival of a Great Tradition Among Modern Artists (London: Weidenfeld and Nicolson, 1985). Simon Martin, John Piper: The Fabric of Modernism (Chichester: Pallant House Gallery, 2016). Frances Spalding, John Piper. Myfanwy Piper. Lives in Art (Oxford: OUP, 2009).